Matthew Majka is an Accredited Exercise Physiologist living in Melbourne Australia. He runs his own practice called Empower Health Concepts. Matthew is considered a movement specialist in sport specific training and rehabilitation. Most notably in skill acquisition and injuries from novice to elite athletes in basketball, dancing, soccer and running. You may have heard of this term being thrown around loosely by professionals. Has something to do with jumping or something…? Brace yourself momentarily for some technical jargon, before we delve deeper. Plyometrics is a training system that focuses on fast, powerful movements to improve functions of the nervous and muscular system. Plyometrics are based upon the concept whereby the muscle is contracted eccentrically (loaded) then immediately contracted concentrically. Think of it this way – Your muscles act like a spring. Push your hand down on the spring (load it) then take your hand off (unload it) and the spring will recoil and propel itself into the air. You can create different angles for the spring (your muscles) to propel you vertically, horizontally, diagonally. Plyometrics is one of the most efficient ways to increase power, to improve athletic performance. Used in sports that require fast powerful movements. For those of you that enjoy mathematics and analysing things, please read this section. If you just want to get the general idea, skip this part! Power is how much work is done in a specific amount of time. The power we produce in our movements originates in our muscles. As a muscles velocity of contraction increases, its maximum force of contraction decreases. A muscle contracting slowly can produce a greater force, than a muscle contracting fast. Ok we’re back, if you don’t have a solid foundation of strength, you WILL NOT be able to produce power efficiently. A vertical jump requires the athlete to produce a large amount of force in a very short period of time to get up in the air. If you lack strength and stability, you won’t produce much power, and will struggle to jump higher. Clearly, a fundamental relationship exists between strength and power. One cannot possess a high level of power without first being relatively strong. Weight lifting exercises especially the squat performed with loads ranging from 50% – 90% of 1RM appears to be the most potent loading stimulus. Various articles and suggestions also state being able to lift 1.5 – 1.75 x BW (body weight) on a squat. 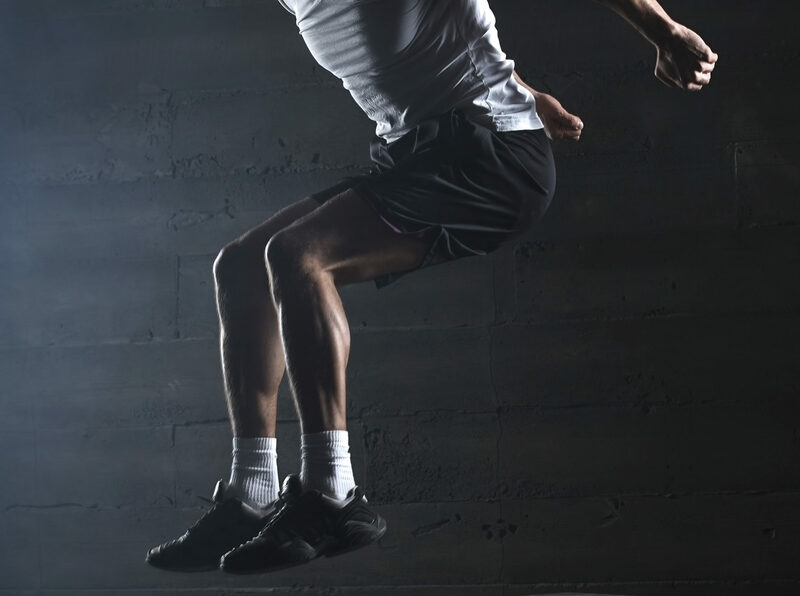 One thing is for certain, you need to start with relatively high levels of strength before beginning eccentric loading exercises like box jumps, depth jumps, sprinting and single legged landing exercises. Put simply, if you lack strength and flexibility and don’t train your muscles to ensure they are healthy and strong, then gravity will definitely be your foe. So here’s how it works – skeleton holds us up, muscles hold skeleton. If we combine our muscle strength with explosive powerful movement training, we effectively give our body the chance to become faster runners, higher and longer jumpers and a better ability to change direction quickly. Muscles help cushion and reduce the amount of ground reaction forces going through your joints, whether it be standing, sitting, running or jumping. A lack of muscular strength is partly the reason for being injury prone, and early onset of degenerative diseases such as osteoarthritis and osteoporosis. IT IS VITAL TO STRENGTHEN YOUR MUSCLES THROUGH RESISTANCE TRAINING AND KEEP THEM STRONG! Want to know more about Exercise Physiology services, and how it can help you? Cormie, P. McGuigan, M. and Newton, R. (2011). Developing Neuromuscular Power. Journal of Sports Medicine, 41(2), pp. 125-145. Crotty, J. and Stanley, P. (2011). Introduction and Development of Plyometrics for Jumpers. Modern Athlete and Coach, 49(2), pp. 24-27. McGinnis, P. (2006). Biomechanics of Sport and Exercise. Second Edition. Champaign, IL: Human Kinetics, 112-113.